Honda will bring in their first ever compact crossover in India in the form of the WR-V. It will be Honda’s all-new vehicle based on the Honda Jazz. The WR-V has a lot in common with the Jazz; both the cars share the same platform, engine, transmission, certain individual body panels and a bit of interior. Even though the new vehicle is based on the Jazz, the car looks very different. The WR-V gets newly designed headlamps, new bumpers with stronger design lines. 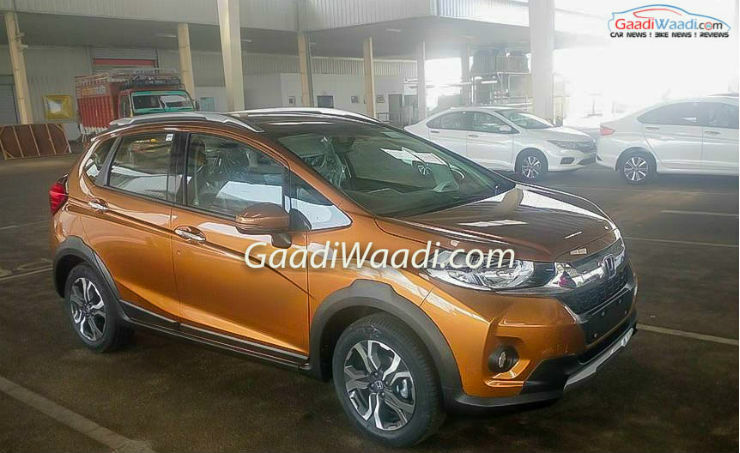 From the side, the WR-V shares the fenders and doors with the Jazz, but it gets body cladding, which makes it look muscular. From the back too, the WR-V looks very different from the Jazz. The WR-V gets a different tailgate and the bumper. The WR-V will be powered by the same engine options as the Jazz. There will be a 1.2-litre i-VTEC petrol engine mated to 5-speed manual gearbox. The four-cylinder petrol engine generates a maximum of 90 BHP of power. The car will also get a diesel engine in the form of 1.5-litre Earth Dreams i-DTEC, that will get the six-speed manual transmission. It generates a maximum of 100 BHP of power. On the inside, the WR-V also shares the dashboard design with the Jazz. The seats are similar to the Jazz. WR-V interiors will be more rugged given its crossover design. Honda will launch the WR-V in March this year. The car will be positioned above Jazz but below City regarding pricing. The WR-V will go against the likes of Hyundai i20 Active, Fiat Avventura and other compact SUVs like Maruti Vitara Brezza and the Ford EcoSport. Honda is facing dwindling sales in the country mostly due to lack of new models. This year, the company is planning to launch the facelift version of the City along with the WR-V, that will attract more customers to the brand.